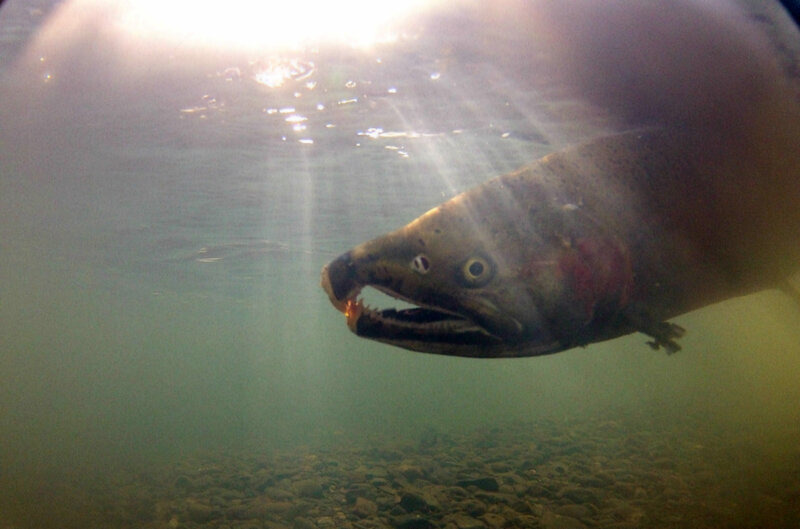 Once home to healthy populations of steelhead trout, coho and Chinook salmon, California’s Russian River watershed experienced a steep decline in the abundance of these fish in recent decades. Historical estimates place the number of coho salmon in California at around 350,000 to 500,000 fish over their entire coastal range, with perhaps 20,000 in the Russian River. The number of Russian River coho salmon smolts entering the ocean is estimated to have declined 85 percent, and during the last two decades less than five adult fish returned to spawn most years. Determined to be on the verge of local extinction within the last decade, coho salmon were listed on the California and Federal Endangered Species lists. In 2001, with the goal of re-establishing self-sustaining runs of coho salmon in tributary streams within the Russian River basin, the California Department of Fish and Wildlife, NOAA’s National Marine Fisheries Service, and the U.S. Army Corps of Engineers created the Russian River Coho Salmon Captive Broodstock Program (RRCSCBP). Under this program broodstock from the region are captured as juveniles and then raised to maturity and spawned at a hatchery at Lake Sonoma. 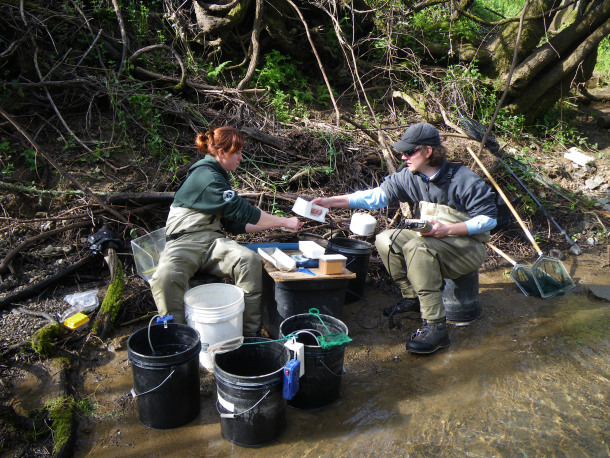 Offspring are stocked into select Russian River tributaries where habitat assessment work or documented historic coho presence have indicated potential for supporting coho populations. Following their release, biologists with the California Sea Grant Extension Program monitor the growth and survival of juvenile fish, their migration as smolts to the ocean, and their return to spawn as adults in the winter after about 18 months in the sea. Data collected allows the program to be adaptively managed to improve the potential for success. The monitoring effort involves close collaboration with more than 500 private landowners who allow scientists access to stream reaches on their private property. California Sea Grant Extension Specialist Paul Olin has worked on the project for more than a decade and leads the monitoring component of the RRCSCBP. “Coho salmon are integral to a balanced, fully-functioning ecosystem. They have a historical legacy in the Russian River as a major source of food for local tribes and until the mid 1900s supported important commercial and recreational fisheries,” said Olin. Olin and his team of field biologists led by Mariska Obedzinski use a variety of methods to monitor the fish, including snorkeling, electrofishing, and Passive Integrated Transponder (PIT) tags coupled with an array of PIT tag antennas. Within the last year, they have installed 24 PIT tag antennas in two arrays that span the Russian River mainstem in Duncans Mills to track the movement of tagged fish and obtain estimates of the total population. 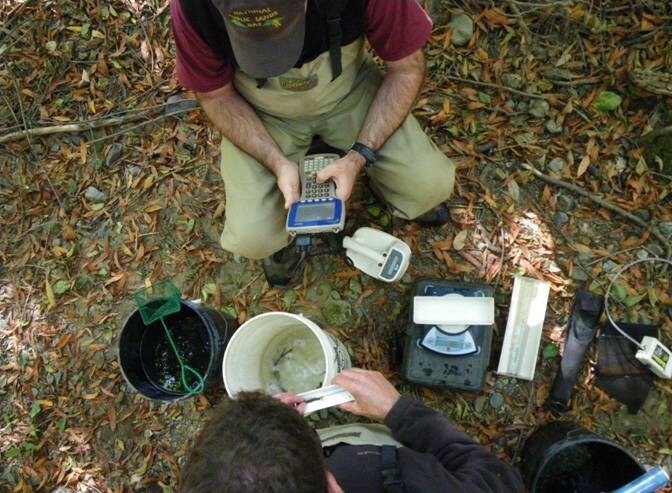 In summer of 2013, CASG Extension personnel documented the presence of an estimated 12,590 juvenile coho salmon – the highest recorded numbers in decades. Olin remains hopeful that the salmon will rebound successfully and thinks this recovery strategy can be applied to other locations.